Dr. Mark Steeley, DVM, graduated from University of Tennessee College of Veterinary Medicine in 2003. He had attended the University of Tennessee previous to that, and graduated with an Associate Arts Degree from Coconino Community College in Flagstaff, Arizona. Dr. Steeley has been at Chilhowee Veterinary Clinic since 2007. He has a special interest in medicine, soft tissue surgery and dentistry. Previous to college, Dr. Steeley was a proud member of the United States Marine Corps, where he served for 6 years as an aircraft mechanic. He has always loved animals and veterinary medicine was a natural choice and progression in his life. Dr. Steeley enjoys backpacking, running, mowing, and anything outside. He has a geriatric orange diabetic cat, Scooter, and a sweet old mare, Summer. Dr. Steeley is married, with three adult children, a wonderful son-in-law and three awesome granddaughters. For further information please see his LinkedIn account. Dr. Walter R. West Jr., DVM, graduated with a B.S. in Agriculture from the University of Tennessee, Knoxville. He continued at UTK earning his Doctorate of Veterinary Medicine from the University of Tennessee College of Veterinary Medicine. He is the founder of Chilhowee Veterinary Clinic, which opened its doors in October of 1983. Dr Walt is now semi retired but still keeps his own client list. I’d like to personally thank everyone for letting us care for your pets over the years. We rarely get a chance to address everyone at once like this, so I thought I’d express that first. I’d also like to inform you of some sad news that has placed us in a transition period that might inconvenience you in some way. A few weeks ago we were informed that Dr Michele Halstead was diagnosed with early stage pancreatic cancer. She is doing fine and is currently in the midst of planning chemo therapy, radiation, and surgery. She is in good spirits and is going to fight this with all she has. If you know Dr Michele, you would expect nothing less. Unfortunately, as expected, she had to step away from the profession she loves for a while. Our thoughts and prayers are with Dr Michele, and we chat, text, and check on her daily. We miss her in many ways and I would like to assure you that we are working feverishly to find a veterinarian to pick up the slack while she is out. This is a long process and could take 3-8 months to find a person who will fit in the Chilhowee family. In the meantime, we have filled in the open spots where we could with qualified “relief” veterinarians, but because of the abruptness of the news, some of the days in this first month have been hard to fill. This means we will be working one doctor short some of those days. Our support staff is awesome and have been doing a great job propping us up and assisting, however we do not want to lower our quality of care to fit everyone in. We simply ask for your continued patience during this transition. If you wish to send Dr Michele a note of encouragement, please send it to the clinic and we will get it to her. You may see her here working a few hours as she feels up to it as she is trying to keep her life as normal as she can. This time will be limited and mostly for routine issues. We think of this as therapy for her as she has a difficult time sitting still. I so appreciate you all and I am confident we will make it through this transition just fine. Thank you for your patience and understanding and don’t hesitate to call with any concerns with your pets, they are still our priority. We also ask that you keep Dr Michele in your thoughts and prayers. Dr. Becca Archer is a 2005 graduate of the University of Tennessee College of Veterinary Medicine. Prior to veterinary school, she completed her bachelors degree in Animal Science at the University of Tennessee. 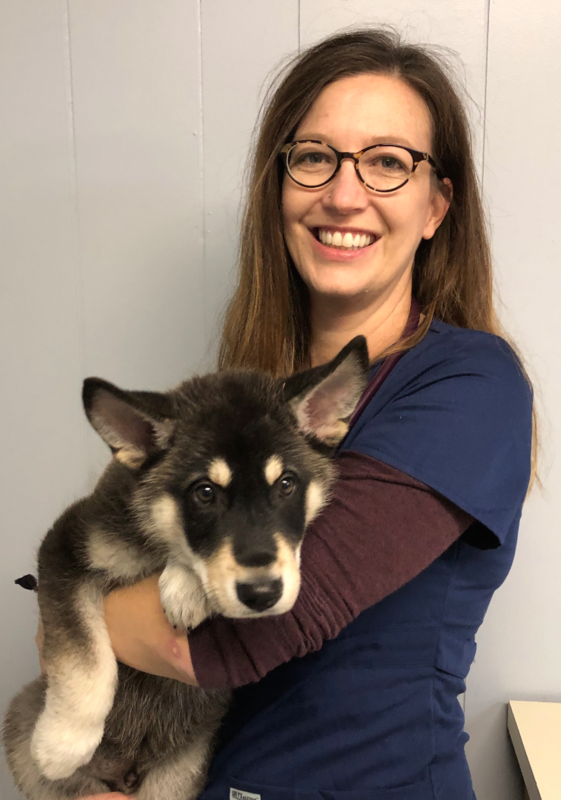 She is native to the Knoxville area and has practiced in both Knox and Blount counties since graduating from veterinary school. Dr. Archer has 2 dogs, Lulu, a boston terrier, and Amos, a hound. She also has a tortoise shell cat named Ms. Kitty. Outside of work, she enjoys spending time with her husband and daughter and four-legged kids. Dr. Angiolina Trump grew up on a beef farm in East Tennessee where she enjoyed working with cattle and spending time with her horses, sheep, dogs and cats. She studied Biology and Animal Science at the University of Tennessee where she received a bachelor of science in Ecology and Evolutionary Biology in 1998. 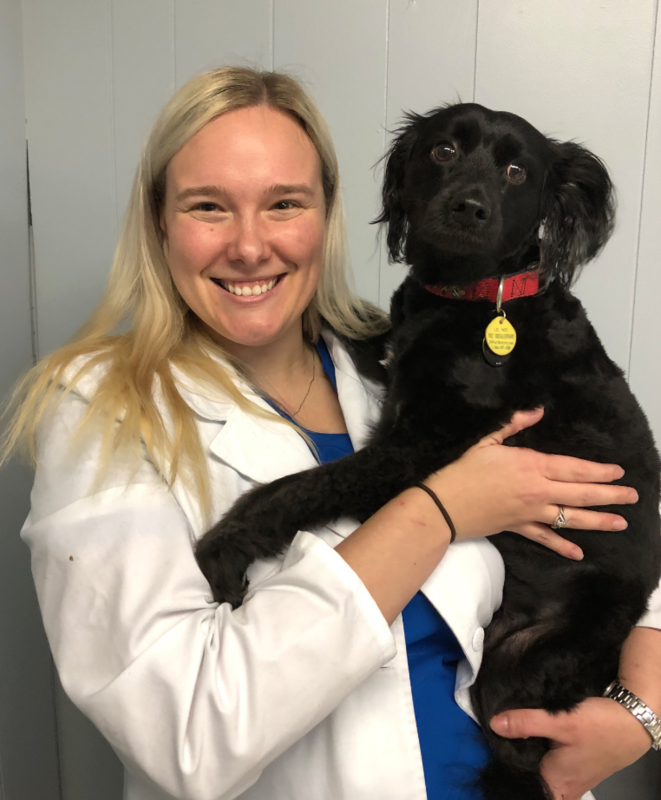 Since graduating from the University of Tennessee College of Veterinary Medicine in 2003, she has been practicing small animal medicine in Knoxville. She has a special interest in Behavior Medicine, Fear Free and Low-Stress Handling, Dentistry, and Internal Medicine. Dr. Trump and her 10-year-old son live with a rambunctious Doberman, Connor, and an adventurous cat, Butter. When she is not working, she enjoys listening to live music, spending time with family and friends, reading, knitting, and outdoor exercise. She will be getting married the first of January to a wonderful man who has a daughter, two sons, and a hound named Beau. Dr. Rachel Cox is a 2017 graduate of St. George’s University School of Veterinary Medicine in Grenada, West Indies. She completed her final year of clinical training at Texas A&M College of Veterinary Medicine in College Station, TX. She is a Maryville native and couldn’t wait to return home. She enjoys spending time with her Great Dane, Moose, shepherd mix, Aries, cat, Larrabee, and two goats, Opal and Loretta. When the weather is nice, Dr. Rachel enjoys fishing, swimming, gardening, and just being outdoors.